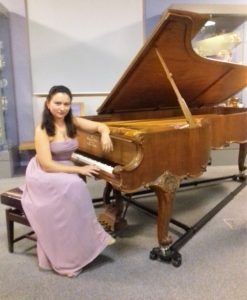 The 75th season of the Sunderland Pianoforte Society continued with a recital given by the young Russian pianist Dinara Klinton and this was an evening of sheer perfection from beginning to end. Anyone who missed this recital missed a treat. Born in Ukraine, Dinara Klinton started her piano lessons at the age of 5 and a year later she entered the Kharkiv Special Secondary Music School. After graduating from the Moscow Central Music School, where she studied between 2001 and 2007 with Valery Pyasetsky, she went on to graduate with honours from the Moscow Sate Conservatory. Dinara has been awarded a Master of Performance Degree by the Royal College of Music and has completed the Artist Diploma in Performance course under the tutelage of Dina Parakhina. As well as winning many competitions, Dinara has toured extensively. The evening began with a beautiful performance of the Bach Partita No.1 in B Flat, played with careful pedalling which never at any time affected the clarity. This was a popular work enjoyed by everyone. Then came the Medtner Sonata Romantica in B flat minor which was quite a revelation as many of the audience had not heard this before. Sadly, Medtner’s music is not widely performed even in Russia. Like many artists, Medtner emigrated from Russia in 1919 after the revolution and after his death in England his wife returned his entire archive to his homeland. In April 2017 Dinara Klinton was part of a group of students working with Professor Dina Parakhina who performed the entire set of fourteen sonatas at the Rachmaninov Hall of the Moscow Tchaikowsky Conservatory. The Sonata Romantica is a very difficult work but was played with great power and authority. The technical difficulties presented no challenge and despite being a relatively unknown work to the audience it was extremely well received. After the interval we heard a beautiful performance of the Sonata in C sharp minor, Op. 27 No.2 (“Moonlight”) by Beethoven, which was enjoyed by the audience. The programme ended with two Transcendental Studies, Nos. 9 and 10, by Liszt, which again were beautifully played and enjoyed. The evening had clearly been a great success as the audience demanded an encore and Dinara finished the evening with Chopin’s study Op. 25 No.1 in A flat. The Society would like to acknowledge the support of Making Music, which is the UK’s leading organisation for voluntary music. Its Philip and Dorothy Green Award for Young Concert Artists has helped to launch the careers of many young musicians and the Society is grateful for the financial help they provide. This entry was posted in Recitals, Reviews on 26/10/2017 by David.